I was intrigued when “From Hula Hoops to High Fashion: G. Fox in the 1950s” appeared on Monday’s agenda for the Newtown Historical Society lecture series. G. Fox was a department store chain when I was growing up in the 70s, but seemed to disappear in the 80s by my teenage years. What was G.Fox? What happened to it? I learned its fate (sold to the May Company), but also learned that there was a more meaningful way to understand the Connecticut retailer by asking how people remembered it. The answer was provided in Elizabeth Abbe’s (from the Connecticut Historical Society) presentation to an attentive Newtown audience. 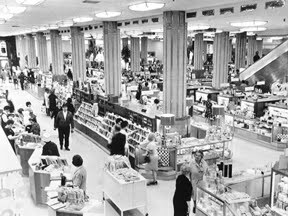 G.Fox was once the largest privately-owned department store in the U.S., operating in Hartford, Connecticut from 1847 to 1993. Started by a German immigrant, Gerund Fox, the store passed to his son Moses, and then to his granddaughter Beatrice Fox Auerbach in 1938. Yes, a woman took on the presidency of the retailer and stayed at its helm until shortly before her death in 1968. During her tenure, she transformed the company into a retail giant, opening an 11-story building that Auerbach decorated in Art Deco styling with elevator service to every floor. Auerbach embraced her employees as part of the G.Fox family. She communicated to all levels of the staff, and fostered camaraderie by bringing managers and workers together form different departments. Benefits for employees included a five-day work week, retirement and pension plans, at-cost meals in the employee cafeteria, paid vacations, generous year-end bonuses, and an in-house hospital pharmacy with a nursing staff that visited employees at home. She also provided no-interest loans to employees. She hired women and provided opportunities for advancement to the highest levels of management, while also hiring African Americans. G.Fox employees remember themselves as valued members of the team and. For some of them, it was the best job of their lives. G.Fox epitomized the meaning of high quality and service. The quality of goods even exceeded what was available in New York City at the time. The impeccable service in every department assured that customers returned to other areas of the store to continue their shopping. Buying a wedding dress at G.Fox often included a stationary purchase for invitations, while portrait photographs were offered free of charge. The full-service treatment meant that the new bride was likely to return for the purchase of housewares. The sales people knew their customers by name and could be counted on for continued service that met each person’s individual needs. As I sat in the audience, it was clear that many people in attendance had memories of the beautiful store and shared what it meant to them. One person remembered the clothes and wedding dresses, another the stationary and books. Each former customer relished the memory of the store’s grand style with vivid recollections of what it meant to shop and own something from G.Fox. Through this interactive exchange, the store came alive to me. I wanted to walk into the past and visit it: to admire the fine clothing, to meet the sales people, to marvel at the decor, and to experience the thrill of owning merchandise with the G.Fox label. The Hartford store closed its doors in 1993. I will never be able to visit the store as it is remembered in its 1950s heyday; but for a brief moment of time, on Monday night, it was open again. NOTE: Much of this text is credited “Remembering G. Fox & Co.” published by the Connecticut History Society. I wish we could bring back some of that old time retailing. But I fear it is lost forever. What a shame. I never really got to experience it, but it seemed like it brought back a lot of fond memories for the people in the audience.